News for product liability attorneys – Telebrands issues recall of Therma Scarf scarves, citing fire and burn risks. Washington, DC – The U.S. Consumer Product Safety Commission (CPSC) http://cpsc.gov and Health Canada, in cooperation with Telebrands Corporation, of Fairfield, New Jersey, announced a voluntary recall of Therma Scarf scarves on March 10, 2010, citing burn and fire risks, as reported by the CPSC. Approximately 98,500 units have been sold in the United States and 1,500 in Canada. They were manufactured in China. The heat packs that consumers take out of the fabric and microwave can overheat, posing a fire and burn hazard to those using the product. Telebrands Corporation has received seven reports of overheating, including five fires. Three of the five fires resulted in property damage to the microwave. Two of the received incidents occurred in Canada. No bodily injuries have been reported. The recalled scarves have pockets and microwaveable heat packs made of flax seeds. The scarves are made of a polyester/cotton blend and were sold in black and camel colors. 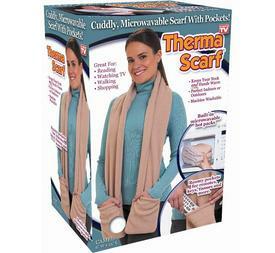 They were sold at Bed Bath and Beyond stores, and were available through As Seen on TV retail kiosks in shopping malls nationwide, direct response television and over the internet at www.thermascarf.com and www.asssenontvguys.com from October 2009 through January 10, 2010. They retailed between $20 and $25. Consumers are advised to stop using the scarf immediately and return it to the place of purchase for a full refund. Telebrands will contact those who purchased the product via internet and infomercial with information on obtaining refunds. For information, Telebrands can be contacted at (800) 777-4034 between 9:00 a.m. and 6 p.m. ET, or visit the company’s website at www.telebrands.com.